Airports: most of us have a love/hate relationship with them. They can be a total nightmare to navigate, and who likes waiting on endless security lines and the idea of lost luggage? Yet, they can be our best friend, as they are often the starting point for an amazing vacation! If your travel includes a cruise, a trip abroad, or even a domestic excursion, flying is one of the fastest and most convenient ways to reach your port or destination. Planning ahead is always a good idea, but for travelers who require supplemental oxygen while flying, advance preparation is a necessity. It’s important to note that neither the Air Carrier Access Act nor the Americans with Disabilities act requires that airlines provide passengers with supplemental oxygen. As a result, airline policies regarding supplemental oxygen vary widely. Similarly, federal regulations prohibit passengers from bringing their own oxygen cylinders aboard for use during flight. For this reason, it is vital to contact your airline well in advance of your trip to inquire about airline policy and procedures. Passengers are responsible for notifying the airline(s) about their need for supplemental oxygen onboard. Be sure to ask about airline policies and give a minimum of 48 hours advance notice. Be sure to ask if the airline provides oxygen service. Chances are that they do not, but it is always a good idea to know all of your options. 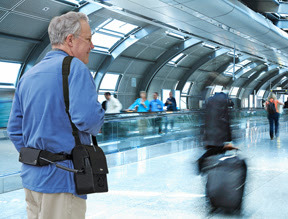 If your airline does not provide oxygen service, you will need to arrange for a Portable Oxygen Concentrator (POC). To date, there are 21 different models of POC’s that are FAA approved.You will need to determine which one best suits your needs. Check to see if the airline requires use of a specific Medical Information Form (MEDIF) for flying with oxygen, or if a Physicians Statement will suffice. To download an example of this form, please click here. Consider the type of oxygen flow you will require, either Continuous or On-Demand. Continuous flow means that the oxygen will flow continuously while the machine is turned on -- for some this is very important -- however, it does limit one’s options on model of unit, as the average weight of a continuous flow unit is 20 pounds. Battery life will also be less than that of an On-Demand unit. Determine which machines will accommodate the liter flow you require. Continuous Flow machines currently only go to a maximum of 3 LPM while on continuous flow. Consider how heavy the machine will be. As mentioned earlier, some machines weigh as much as 20 pounds (9 KG) to as little as 2 pounds (0.9 KG), although most rental units will weigh a minimum of 4.4 pounds (2 KG). Please make sure the model you select is FAA approved. Consider the life of the batteries and how many you will need for your trip. Airlines have different policies for how many batteries are required, but a good rule of thumb is to carry 150 % of the amount you would need for your flight. So, if you have six hours of travel time, you would need nine hours of battery life. Also, keep in mind your travel time to and from the airport, as well as any layovers you might have. While on a layover, you should also check to see if you can plug your machine in to charge it. With possible delays, having extra is always a good idea. Again, size and life of the batteries will vary based upon the POC you select and the liter flow you require. TSA outlines the official policies on air travel with oxygen. The Airline Oxygen Council of America offers some helpful information on the most current airline policies. As always, if you’re planning to rent oxygen or other respiratory equipment for your travel, be sure to visit us at www.specialneedsgroup.com. Arrive at the airport early! If you are traveling with respiratory equipment, you must make arrangements for the screening/security checkpoint process. TSA must clear all oxygen equipment before it will be permitted on board. Special Needs Group is certified and licensed to carry all types of oxygen-delivering systems, from traditional gaseous oxygen cylinders in a variety of types and sizes, to liquid oxygen systems, to the newest Personal Oxygen Concentrators (POCs). Additionally, our staff is trained to ask the right questions to insure that passengers get the oxygen they need, and, more importantly, have it delivered using a method they know and understand. 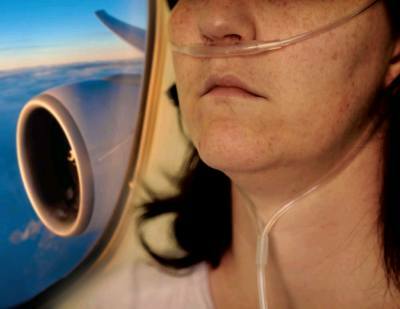 Planning air travel with oxygen? We’re here to help! Be sure to give us a call at 1.800.513.4515.